The second-year Vegas Golden Knights are operating as if they’re in win-now mode, and why not? They absolutely are. Meanwhile the Montreal Canadiens are trading away their captain in the middle of the night. So that’s how things are going! 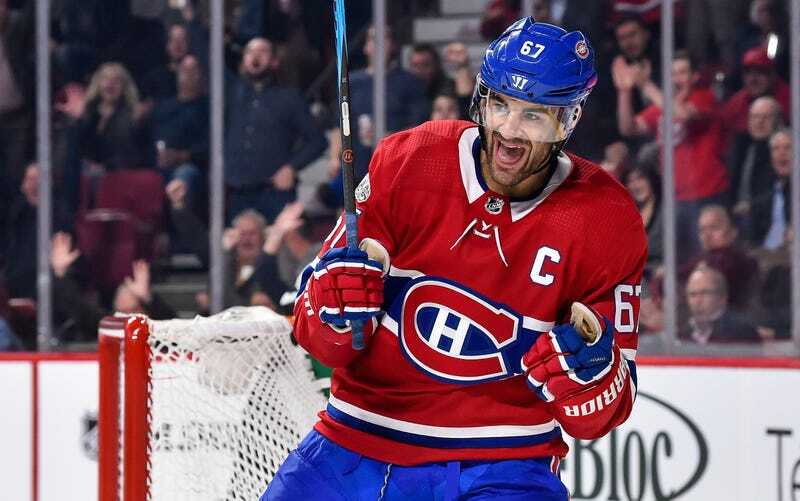 Max Pacioretty is heading to Vegas in exchange for Tomas Tatar, touted forward prospect Nick Suzuki, and a second-round pick. And to a certain extent, the Golden Knights were spending house money. Both that second-round pick and the first-round pick they used to select Suzuki came over from the Blue Jackets, plus David Clarkson’s contract, in exchange for the Knights not selecting certain Columbus players in the expansion draft. So they took William Karlsson, who went out and scored 43 goals for Vegas. Yes, the Tatar deadline deal was a disaster, but Pacioretty represents a pretty significant upgrade at left wing without trading anything besides what were, at least initially, surplus assets. Pacioretty, 29, had a down year, missing time with a knee injury and surrounded by a pretty miserable Canadiens squad. But he has been a remarkably consistent scorer otherwise, racking up 30-something goals and 60-something points in each of his previous five full seasons. He’s going to look real good on Vegas’s revamped second line, (probably) opposite Alex Tuch and (almost certainly) centered by free-agent acquisition Paul Stastny. The Knights also have the cap space to sign him to a four-year, $28-million extension without too much stress. Going the other way in this trade is some potentially good value. Tatar, 27, also had a rough year and would seem a good candidate for a bounce-back, though he won’t exactly be playing alongside barn-burning talent. The deal will likely ultimately come down to the 19-year-old Suzuki, the Knights’ No. 4 prospect by one accounting, an offensive-minded centerman who may ultimately turn out to be too small to keep playing center. Even if it’s a decent haul, it could have and would have been heftier if not for the fact that everyone in hockey knew Pacioretty wanted out of Montreal, and that there was just about zero chance the Habs were ever going to re-sign him. The Canadiens and GM Marc Bergevin somehow spent a year driving down their own leverage ahead of a trade that was always going to happen, and even if Suzuki pans out, that has to color any analysis of this deal. With a series of big trades of disgruntled players, the Canadiens have not, on the whole, gotten that much younger, or even particularly cheaper. They obviously have not gotten better. They are spinning their wheels and only getting more enmired. Do they still think Bergevin is capable of getting them out of this muck?